We are proud to be a CERTIFIED auto repair facility. At B.A.T. Boys, we are committed to quality service. We have consistently earned high marks in customer satisfaction for our dedication to keeping you and your vehicle safe on the road. We carry a large inventory of in-stock parts. Our service department is second to none. Your satisfaction is our highest priority! We offer a coffee bar, flat screen TV, reading materials, comfortable indoor/outdoor seating. We also have an enclosed children's play area (with clean toys books etc,) in view of our customer seating. When you car is due for an oil-change, inspection or tire rotation, we will send you a friendly reminder. Sign up for this complimentary service the next time you bring your vehicle in to be serviced! We are experienced at using computerized engine diagnostics to quickly and accurately identify and treat whatever symptoms your auto is experiencing. Joe C.: "A noise developed under the hood and wasn't sure what it was. I knew I could take it to Jeremy at BAT Boys and have no worries about getting scammed for extras...These guys are the BEST. I promise you!" Doug G. (Kennedale, TX): "The owner, Buzz McQueen, proved to be extremely trustworthy and didn't take advantage of us, when so many would have. I would highly recommend them to anyone." Lou C. (Blue Eye, MO): "best in town and they have never overcharged me for service." 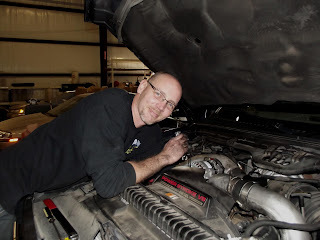 Harold H. (Branson, MO):: "Very friendly, professional and honest. Very pleasant environment and nice honest people who own and operate the facility." David W. (Branson, MO):: "My cousin, a support manager at Walmart Tire and Lube Express, highly recommended them upon discovering that I needed new brakes. More businesses would do well to follow their example." Evelyn B. (Branson, MO): It actually took a little less time than they estimated! Every time I do business with them I have a great experience! Heidi F.: "friendly and helpful. A great place." Trisha S.: "Upon entering the establishment, I was greeted with a smile from the receptionist. It was good to know that they did not discriminate against a potential customer regardless of their ethnicity. I am a African American woman, whom quite often doesn't feel very welcomed when she is out in public." Debbie B.: "GREAT service!!!! they were very nice and i will not take my cars to be serviced any where but to BAT Boys!!!!! Buzz thanks a million for working on our cars!" Daniel G.: "My '98 Dodge Dakota's brake system had failed and these fine folks brought it back to life... Thanks, I'll be back!! A+"